No matter how hard one might try, “you cannot make a silk purse out of a sow’s ear.” A lot of the food that’s available in these parts makes us think of that old sow’s ear. That’s not to say that we’re embarrassed by our food, we just know there is no substitute for starting with the best stuff, like a juicy, vine-ripened, grown-in-the-earth tomato. So, we decided to get some of that corporate pop-culture “proactivity” and we bought ourselves a truck and hired a victualer (Cool word, eh?) who runs around and buys fresh food. It tastes better. We’ve talked about this before and we’ll probably talk about it again because our Field Truck Initiative is the big news around here. This letter will also give you the scoop on some O.Henry packages, a cooking class, our “e-news” plus a winter recipe. The earth may be dormant, but we’re not. While waiting for Spring, with its flavor-packed fruits and vegetables, we’ve been perfecting ways to bring the best locally grown and produced foods to our tables. We know that “the nearer the farm to the fork the better the flavor,” so Jim Scoggin, our Victualer, uses our Field Truck for this purpose. Our #1 mission priority is to “provide the highest quality food and drink at a good value,” and this is really putting our money where your mouth is. We’re confident that our flavors have gotten better since we opened our first Lucky 32 in Greensboro, fourteen years ago. We’re also confident that this Field Truck Initiative will further enhance our flavors. We’re excited, too, because using more local ingredients not only means better flavors, it also means more variety. So, don’t be surprised if you notice that our salads are little bit different from May to October, because often (not always), we’ll be serving what our partner farmers are growing and harvesting. Jim Scoggin and Bart Ortiz, our Vice President of Flavor and Consistency, got to know some of our farmer neighbors better this past November when they attended the Carolina Farm Stewardship Association’s (CFSA) 17th Annual Sustainable Agriculture Conference in Boone. CFSA is a non-profit member organization that works with North and South Carolina farmers, gardeners and consumers to develop healthful, sustainable agriculture. The purpose of the CFSA Conference was to bring together friends and neighbors who are interested in developing a local food system in the Carolinas. Nearly 500 people turned out to swap tips and tricks of the growing trade, and to attend some of the nearly sixty workshops that covered everything from seeds to sales, practices to politics. The keynote speaker was Elizabeth Henderson, who owns and operates Peacenote Organic Farm in Newark, New York. Ms. Henderson’s farm is “staffed” entirely by members of the surrounding community who work together to plant, grow and harvest the food that they use from the farm. Her success at developing a sustainable, community-based food system was inspirational and reaffirming. It’s thrilling to know that this kind of idealistic project can really work. Bart and Jim were impressed with the sincere intentions of the participants, and with the level of camaraderie and trust at the event, where there were long in the tooth hippies, wet behind the ears “green” starched shirts and every make and model in between. Of course, one of the highlights of the event was a buffet that featured dish after dish of creative organic cookery that included everything from free-range curried chicken with ginger-mashed sweet potatoes, to vast bowls of salad made with fresh-picked, crisp greens of all kinds, and tofu salad with roast garlic vinaigrette. A few other highlights included seminars such as “Permaculture Garden Design,” “More Fun Salad Production,” “Labor – How Successful Growers Deal with It,” and “Love Those Peaches.” Bart especially enjoyed learning about heirloom apple varieties in a talk given by Bill Moretz of Moretz Mountain Orchards. Mr. Moretz grows more than ninety varieties of apples in the five-acre orchard that’s been in his family for three generations. Looks like we may have found our perfect apple grower! Jim and Bart went to this conference with several purposes in mind. They wanted to make more contacts with North Carolina growers, and they wanted to learn more about the farming way of life. Our goal is to create a model for bringing fresh, local produce to restaurants on a large, sustainable scale. We believe that we’ll accomplish this only if we create a win/win/win enterprise for our farmer partners, you (our guests) and us. We love the idea of answering to the notion of a “triple bottom line” of profit, environmental sensitivity and social responsibility, and we’re enthusiastic supporters of a “permaculture” ideal that falls in line with this notion. Permaculture, a term coined in 1978 by Dr. Bill Mollison (from Tasmania in Australia) is planning, “consciously designed landscapes which mimic the patterns and relationships found in nature while yielding an abundance of food, fiber and energy for provision of local needs.” He says, “Conventional agriculture is to Karate nature, but with permaculture you ‘Aikido’ it.” For posterity’s sake, which we think about even more with our dearly loved four-year old twins, we believe we must find ways “…to meet the needs of the present without compromising the ability of future generations to meet their own needs.” We’re confident that this is possible, if the successes we saw at the conference continue and become more widespread. We hope to give back to our community even more as our Field Truck Initiative grows and develops. For more information about CFSA visit their website at carolinafarmstewards.org. We’re always open to developing partnerships with more farmers – if you have any leads, or ideas about our Initiative, please drop Bart a line at bortiz@qwrh.com. We are honored, and humbled, that the O.Henry Hotel has been awarded the AAA Four Diamond Award for the fourth year in a row. We’re thrilled that our hotel has been chosen yet again for this top-notch rating. 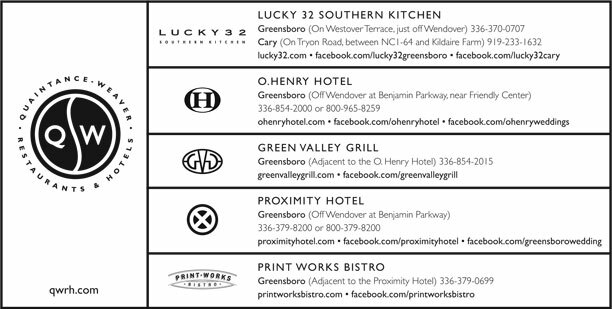 December’s incredible ice storm left many without power, but all four Lucky 32 restaurants, the Green Valley Grill and the O.Henry Hotel were fortunate to keep theirs. We became “ports in the storm.” As inconvenient as it was for many, it was a gratifying experience for us. We get our kicks from “serving,” so serving when it’s not just wanted, but needed, is even more satisfying. At the O.Henry we normally serve people who don’t live nearby (unless they’re smart enough to take advantage of our great hotel packages) so having the hotel filled with neighbors was really neat. We even learned a few things, like we need cards and games in our lobby so folks who just want to pass the time have more to do. And it always feels good to get kind notes, so we felt mighty good when probably half of our guests went to the trouble of thanking us (or, more accurately, thanking Martha Schroeder, Sherrill Baker and the rest of our team) for the fine accommodations and courteous service. Most folks also mentioned their appreciation that we offered those displaced a rate that was $65 below our posted rate. The clouds that brought the freezing rain had a silver lining!